Breakfast, lunch and dinner are perfect opportunities for our campers to make new friends while fueling up for their upcoming camp activities. Campers enjoy family style dining in our Main Lodge. We offer well-rounded meals including meat, a starch, and vegetables. Alternate options for breakfast include cereal, yogurt and toast. Lunch and dinner include salad bar, deli meat for sandwiches. Fruit and milk are available at all times during the day. Here is a sampling of some of the yummy meals our dining staff serves at summer camp. We think you’re going to love eating here! Day Campers receive lunch and two snacks per day. 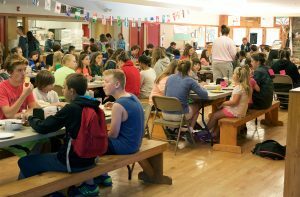 Resident/overnight campers receive breakfast, lunch, dinner and three snacks per day. Does your child require special dietary needs? Please contact us prior to their week at camp so we can best serve your camper’s needs.